Heat oven to 350°F (325°F for dark or nonstick pans). Grease or spray bottom and sides of 2 (13x9-inch) cake pans. In large bowl, make cake mixes as directed on box using water, oil and eggs. Divide batter evenly between pans. Bake 25 to 30 minutes or until toothpick inserted in center comes out clean. Cool in pans 10 minutes; remove from pans to cooling racks. Cool cakes completely, about 1 hour. Meanwhile, in each of three small bowls, add blue food color to 2 1/2 cups frosting, add red food color to 1 1/2 cups frosting and add yellow food color to 1 cup frosting. Using long serrated knife, trim 1/4 inch off side of 1 cake layer. If necessary, cut rounded top off layer to make a level surface. Place layer on tray, cut side down. To seal in crumbs, frost top and sides with thin layer of blue frosting. Freeze 30 minutes to set frosting. Meanwhile, using long serrated knife, trim 1/4 inch off short sides of cake and 1 inch off long sides of cake. If necessary, cut rounded top off cake to make a level surface. 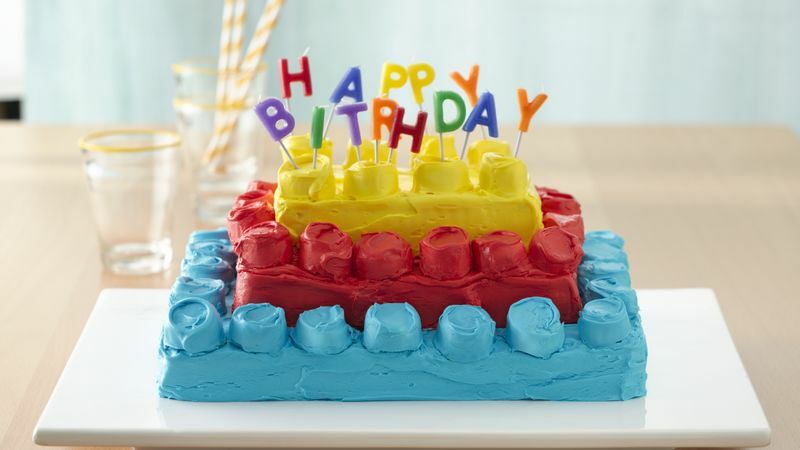 Cut cake lengthwise into two pieces, one about 8x6 inches and one 4x6 inches. Place pieces, cut side down, on individual plates. To seal crumbs, frost top and sides of 8x6-inch cake with thin layer of red frosting and the 4x6-inch cake with thin layer of yellow frosting. Freeze pieces 30 minutes to set frosting. Add final coat of frosting to each cake piece. Using metal spatula to lift and place each cake piece, center red cake on top of blue cake, and center yellow cake on top of red cake. Frost 20 marshmallow halves with blue frosting; place around edge of blue cake. Frost 14 marshmallow halves with red frosting; place around edge of red cake piece. Frost 8 marshmallow halves with yellow frosting; place on top of yellow cake piece. Store loosely covered.